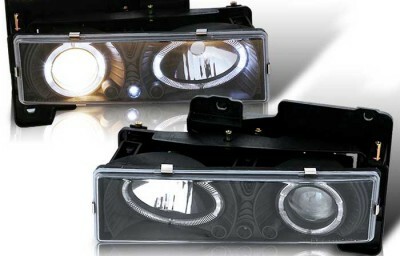 Scroll down for more info on our Chevrolet Projector Headlights! These custom projector head lights for your 88-98 Chevy/GMC Fullsize or SUV will allow you to very easily improve the stock look of the front of your truck! 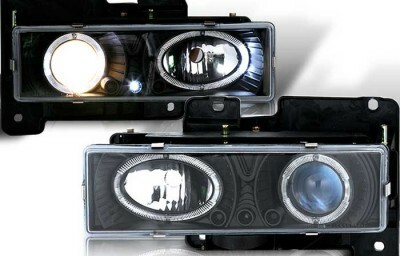 Your original headlights are probably "yellowing" from old age and are dimmer than ever! These custom headlights are direct plug-and-play replacements of your original headlamps and can be added to your vehicle even if you just want to feel safer while driving at night. The projector style beam of these headlight assemblies will allow you to see farther down the darkest road and also give you a wider viewing area. If you are going for a custom look these headlights can't be beat! Each set features brilliant chrome reflectors, LED marker-lamps, and custom Halos that light up with your parking lights! If you want a custom look, and quality without compromise, for the front of your 88-98 Chevy or GMC Fullsize truck, then you need a set of these custom headlights! Projector Low-Beam Technology throws light farther and wider than ever! You Save $75 by shopping with us!